A month ago I was lucky enough to be sent a package full to the brim of skincare goodies to try out and review. 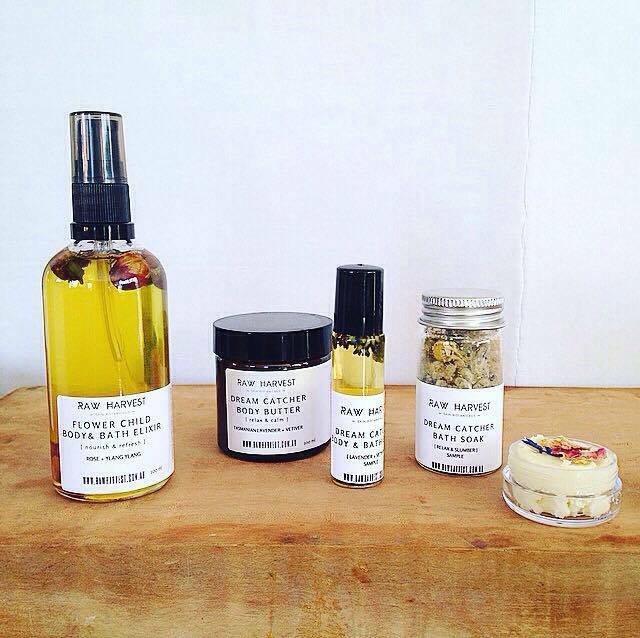 The sender of this beautiful package was Naomi Growden; owner of Raw Harvest Skin Botanicals. 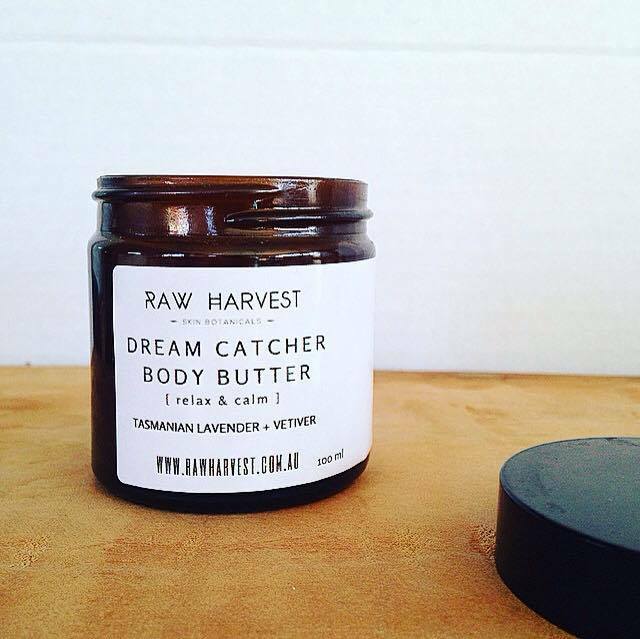 Raw Harvest is organic, vegan, small-batch botanical skincare based in the Adelaide Hills, Australia. This dreamy body butter melts on your skin and leaves skin so silky smooth and calm. Formulated with luscious pure plant butters & cold pressed oils, infused with 100% pure essential oils- this body butter treats the skin whilst calming and relaxing the mind. The perfect antidote to our busy world. This body butter contains a base of luxurious and skin loving shea butter, coconut oil, cocoa butter, mango butter, olive oil, avocado oil and calendula infused sunflower oil. Certified Organic Fair-trade Shea Butter is a skin superfood that comes from the seeds of the fruit of the Shea (Karite) tree and that is naturally rich in vitamins A, E and F. It provides the skin with essential fatty acids and the nutrients necessary for collagen production, is incredibly nourishing and moisturising, and reduces inflammation and smoothes the skin. Coconut oil contains the antioxidant Vitamin E, known to protect skin cells from damage over time. The Vitamin E found in coconut oil soothes eczema, sunburn and psoriasis. Cocoa butter is so valuable with its high concentration of antioxidant compounds, including oleic acid, palmitic acid, and stearic acid. They help to neutralize free radicals in the skin reduce the signs of aging, including wrinkles and age marks. Research has also shown cocoa butter to reduce the appearance of scars on the skin and reduces inflammation in the skin making it perfect for sensitive skins. Mango butter is rich and luxurious, locks in moisture, softens and protects the skin. Virgin Olive Oil is moisturising, softening, high in essential fatty acids, very nutritious, excellent penetration, soothes, reduces scars, moisturises the skin. 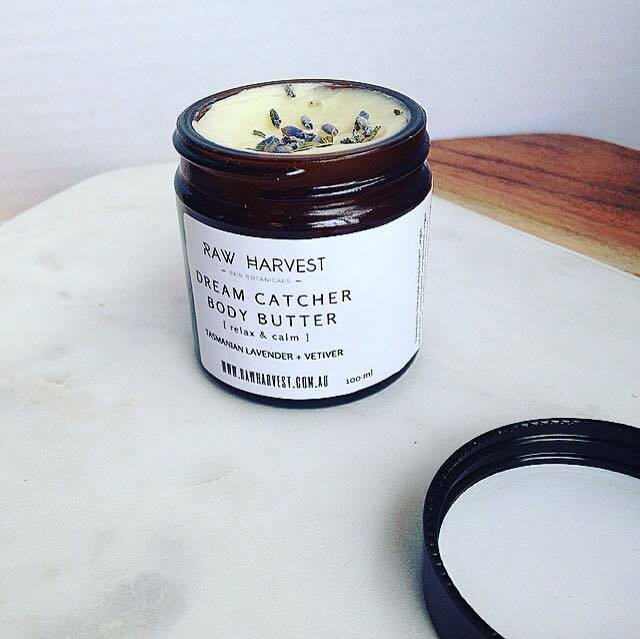 Dream catcher contains essential oils that calm, relax and soothe, while Flower Child contains ingredients that uplift, balance and ground. Dream Catcher Full Ingredients: Certified Organic Fair-trade Shea Butter, Certified Organic Virgin Coconut Oil, Certified Organic Cocoa Butter, Mango Butter, Virgin Olive Oil, Avocado Oil, Certified Organic Calendula Infused Sunflower Oil, Vetiver Essential Oil, Tasmanian Lavender Essential Oil, Frankincense Essential Oil, Petitgrain Essential Oil, Vanilla Essential Oil, Clove Essential Oil, Mandarin Essential Oil, Vitamin E.
Flower Child Full Ingredients: Certified Organic Fair-trade Shea Butter, Certified Organic Virgin Coconut Oil, Certified Organic Cocoa Butter, Mango Butter, Virgin Olive Oil, Avocado Oil, Certified Organic Calendula Infused Sunflower Oil, Ylang Ylang Essential Oil, Jasmine Essential Oil, Blood Orange Essential Oil, Rose Geranium Essential Oil, Lime Essential Oil, Patchouli Essential Oil, Peru Balsam Essential Oil, Vitamin E.
Both body butters are super concentrated and contain zero water, meaning that a little product goes a long way. To use, I take a small amount, warm in between my palms until it melts into an oil consistency, and then apply to my skin. 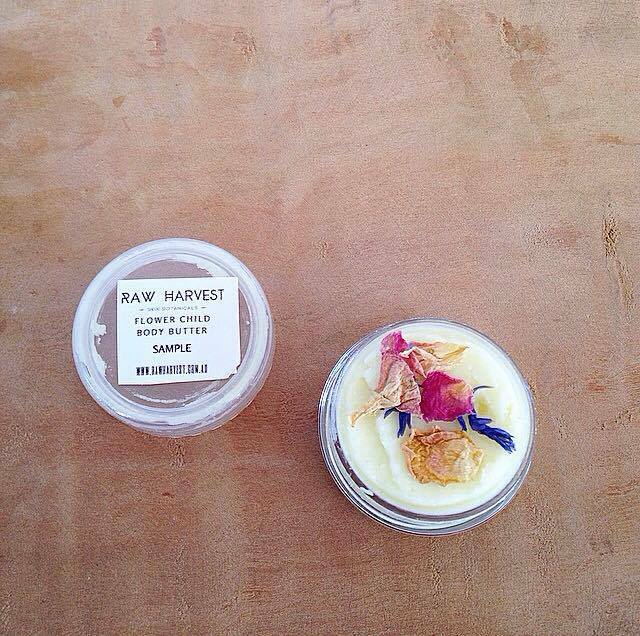 Raw Harvest's body butters are so creamy and thick, but not greasy. I also love the touch of the dried flowers placed on top of the product; so pretty! These body butters are the perfect thing to tackle my dry skin, and leave my skin hydrated all day. 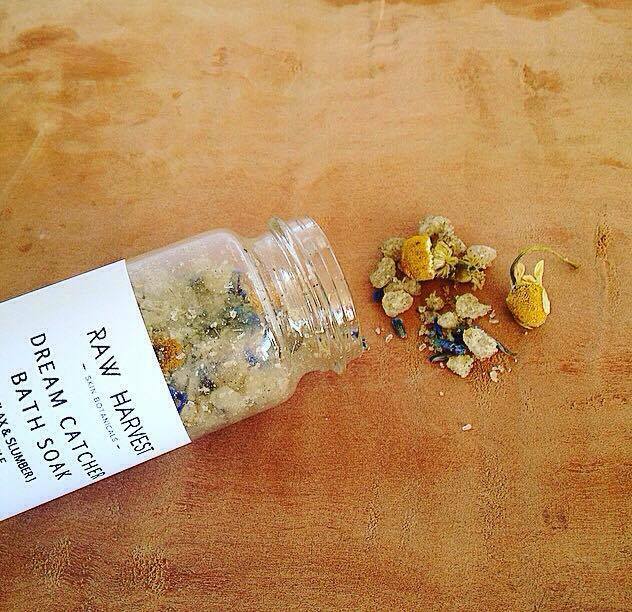 Raw Harvest's Dream Catcher Bath Soak will calm the body and mind and help you unwind after a busy day and assist with drifting off into a peaceful sleep. A combination of Dead Sea Salts, Himalayan Salts and Epsom Salts help relieve muscular aches and pains and remineralise the skin. Organic Chamomile and Lavender help to reduce irritation and calm the skin, great for those with eczema or problematic skin. Essential oil of Tasmanian lavender adds an extra lavender boost for complete relaxation and calm! Full Ingredients: Organic Lavender Powder, Organic Chamomile Powder, Himalayan Pink Salt, Dead Sea Salt, Epsom Salt, Bicarbonate Soda, Chamomile flowers, Lavender Flowers & Corn Flowers, Essential Oils of rose geranium and sweet orange. To me, there is nothing more relaxing than a nice long soak in a steaming hot bath. My baths usually contain a big scoop of coconut oil and some sea salt, but this bath soak mix is infinitely more luxurious. This bath soak smells amazing, and relaxes my whole body. Also, how pretty is it to have flowers floating in the water?! The combination of salts in this soak really heal my skin and help improve any cuts or acne I have on my body. This soak is the perfect addition to a bedtime bath to help lull you into a long, deep sleep. This dreamy oil blend is a wonderful multipurpose product that can be used as a body, massage or bath oil. This oil comes presented in a clear glass bottle and infused with lavender or rose buds, depending on the oil scent you pick. The base of both scents is a blend of camellia, jojoba, avocado, apricot kernel, sweet almond and macadamia oils. Camellia oil protects the skin from ageing due to it's high antioxidant properties, helps to calm the skin and reduce irritation, and is quickly absorbed into the skin. Jojoba oil is a luxurious oil that softens the skin and leaves it feeling plump and smooth, and seals in moisture and protects the skin from the elements. Avocado oil is a rich and nourishing oil high in Vitamin E to repair and heal the skin. It is very nourishing and high in Vitamin A to repair the skin and reduce signs of ageing. Apricot kernel is a light weight oil that is quickly absorbed into the skin. Dream Catcher Full Ingredients: Certified Organic Camellia Oil, Certified Organic Jojoba Oil, Certified Organic Avocado Oil, Certified Organic Apricot Kernel Oil, Sweet Almond Oil, Certified Organic Macadamia Oil, Vetiver Essential Oil, Tasmanian Lavender Essential Oil, Frankincense Essential Oil, Petitgrain Essential Oil, Vanilla Essential Oil, Clove Essential Oil, Mandarin Essential Oil, Infused with organic Lavender flowers, Natural Vitamin E.
Flower Child Full Ingredients: Certified Organic Camellia Oil, Certified Organic Jojoba Oil, Certified Organic Avocado Oil, Certified Organic Apricot Kernel Oil, Sweet Almond Oil, Certified Organic Macadamia Oil, Rose Geranium Essential Oil, Jasmine Essential Oil, Patchouli Essential Oil, Essential oils of Peru Balsam, Lime, Ylang Ylang and Blood Orange, Infused with organic Rose Buds, Natural Vitamin E.
This oil is simply exotic! 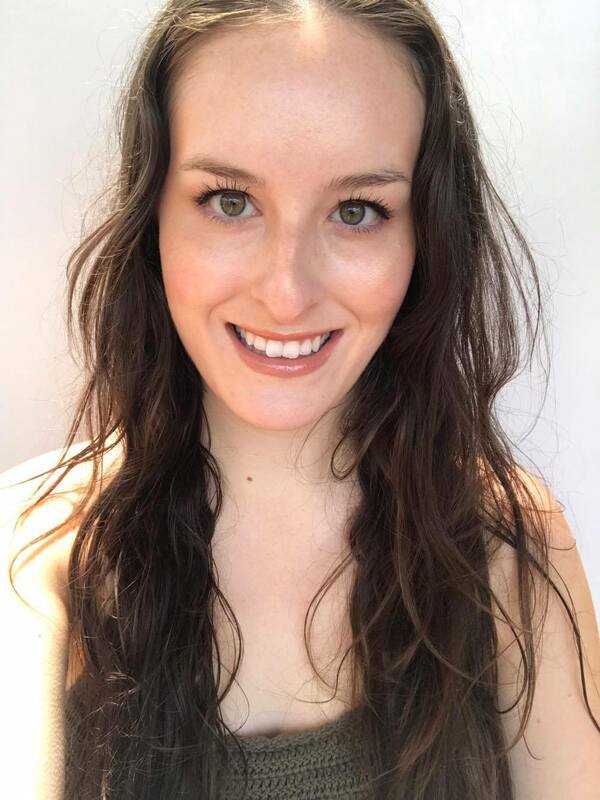 it is uber hydrating but not greasy in the slightest, and absorbs into my skin beautifully. I love the pump design as it ensures I don't waste any product. I use this oil purely as a body oil, but I do try to give myself a little massage as I apply it. I also recommend using this as a hair oil; simply work a few drops through the ends of your hair! 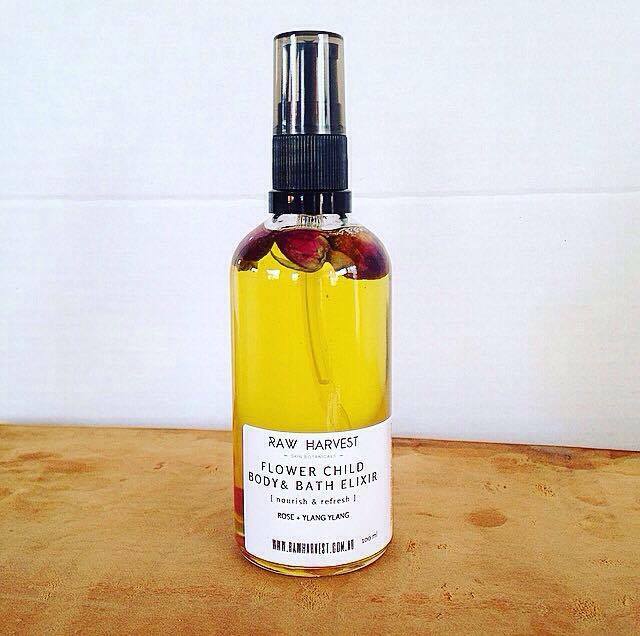 I prefer the Flower Child over the Dream Catcher oil purely due to the jasmine and rose geranium essentials oils, which make this oil smell sweet and floral. I do reach for the Dream Catcher if I am applying oil of a night time or if I need something calming. As I have acne-prone and dry skin, my skin is suited to both the purifying and radiance skincare ranges. Both come as fairly thick oils (castor oil is the first ingredient) that are able to remove daily makeup and grime with ease. Cleansing oils can be removed with a warm washcloth and steam, or can be followed with a gentle foaming cleanser to remove excess oil. 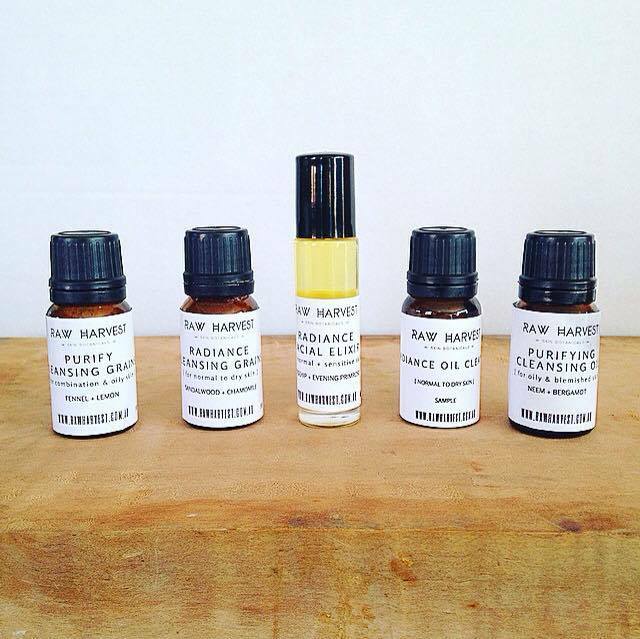 These oils left my skin feeling clean, balanced and fully hydrated. As for which oil is better, I would pick the one that suits your needs better. Have blackheads and breakouts? Choose Purifying. Have dry/normal skin? Radiance is a better bet. Purifying contains neem to fight and prevent breakouts, hazelnut to reduce oil production and pore size, and geranium for its antibacterial and skin healing properties. Radiance contains lavender to calm, heal and for its antiseptic qualities, rose geranium to balance oil production, and olive oil for its high antioxidant and vitamin E content. Purifying Oil Full Ingredients: Certified Organic Castor Oil, Certified Organic Sunflower Oil, Certified Organic Hemp Seed Oil, Certified Organic Neem Oil, Hazelnut Oil, Geranium Essential Oil, Bergamot Essential Oil, Natural Vitamin E, Rosemary Extract. Radiance Oil Full Ingredients: Certified Organic Castor Oil, Certified Organic Macadamia Oil, Certified Organic Hemp Seed Oil, Apricot Kernel Oil, Certified Organic Virgin Olive Oil, Tasmanian Lavender Essential Oil, Rose Geranium Essential Oil, Natural Vitamin E, Rosemary Extract. These cleansing grains are two luxurious blends of precious earth clay, organic ground herbs, flowers & grains to gently cleanse and exfoliate the skin. The first ingredient in these grains; clay, helps to absorb impurities whilst rice powder and oatmeal brighten and calm the skin. These grains are recommended to be used as a daily cleanser, or as a weekly exfoliant. I used these as an exfoliant by adding water and mixing into a smooth paste, and gently rolling the product over my face. The purifying grains smells like a combination of lemon and liquorice and clay, and has more scrubby particles than the radiance grains. The radiance grains have a non-distinct herbal scent and seem to have a more smooth clay consistency. Both cleansing grains rinse clean and leave my skin looking lovely and flushed, glowing, and feeling so smooth. Purifying Grains Full Ingredients: Rhassoul Clay, Organic Ground Oats, Organic Brown Rice Powder, Organic Liquorice Powder, Organic Rosehip Powder, Organic Dandelion Root Powder, Organic Lemon Powder, Organic Fennel Powder, Lemon Essential Oil. Radiance Grains Full Ingredients: Australian Pink Clay, Organic Ground Oats, Organic Brown Rice Powder, Organic Chamomile Powder,Wild-crafted Marshmallow Root Powder, Organic Dandelion Root Powder, Sandalwood Powder, Organic Rose Powder, Frankincense Powder, Frankincense Essential Oil, Natural Vitamin E.
This facial oil blend is designed for those with normal and sensitive skin. I love that camellia oil is the first ingredient of this blend! Camellia oil protects the skin from ageing due to it's high antioxidant properties, helps to calm the skin and reduce irritation and is quickly absorbed into the skin. This oil is so nourishing and healing to my skin. It is lightweight and absorbed quickly by my skin. This elixir is balancing and hydrating, and I haven't experienced any breakouts from it. 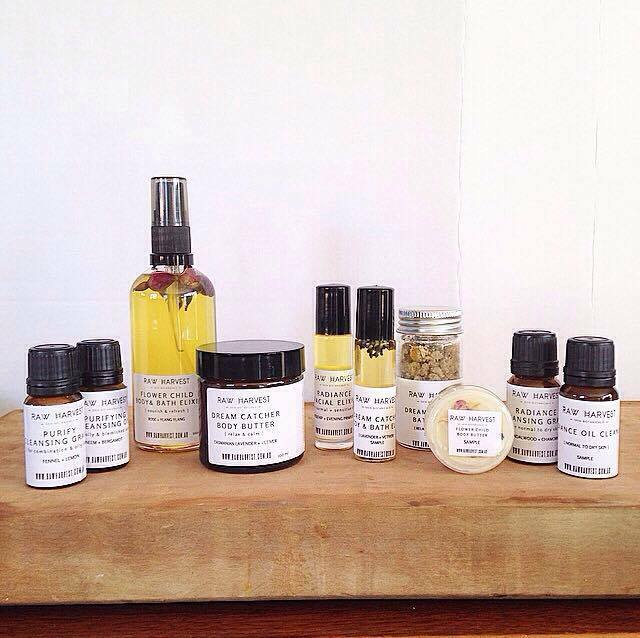 Neroli Essential Oil, Natural Vitamin E, Rosemary Extract. 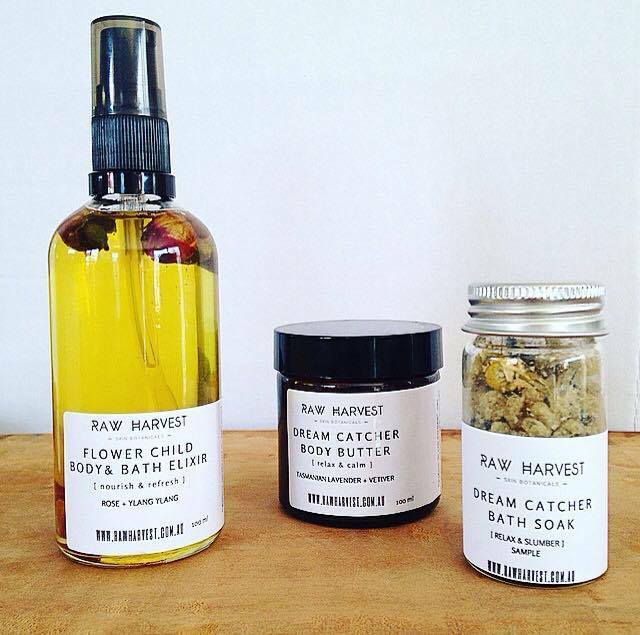 Want to order your own Raw Harvest Skin Botanical goodies? Check out their etsy store.